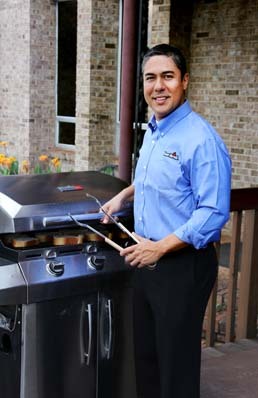 Char-Broil makes every customer feel like a hero behind the grill with the help of its marketing director, Hector Garcia. It’s no longer all about hot dogs and hamburgers when it comes to the family grill. Inspired by celebrity chefs, cooking shows, and gourmet restaurants, modern backyard barbecuers want to impress, dazzle, and out-cook friends and neighbors. And those consumer demands are changing the marketplace in a big way. Hector Garcia, marketing director for Char-Broil, feels the pressure to roll out increasingly innovative grills and accessories in a market more popular than ever before. Char-Broil leads the field, pushing more gas grills across the nation than any other brand. Now, Garcia is leveraging his 20 years of international experience (with Warner-Lambert, PepsiCo, Ahold, and Ashland) to launch new products in North America and help the brand expand to Latin America and Europe. Garcia started in Caracas working as an engineer, but his talent for collaboration pulled him in another direction. “I moved to marketing because I wanted to have first-hand contact with consumers and to get the chance to build strong relationships with sales, finance, and production. A marketer is the orchestra director and the heart of the business,” explains Garcia, adding that he thrives when connecting customer needs with companies and products. After several years in PepsiCo, Garcia moved to Boston to pursue his MBA. “I chose the United States because there, students interact with many cultures,” he says. Those cultural interactions have deepened Garcia’s understanding of global attitudes, customs, behaviors, and markets. He uses that knowledge and experience to help Char-Broil find success across the globe. Today, as his team seeks to penetrate these international markets, Garcia continues to research the nuances of each location from consumer behavior to regional economics. Collecting and analyzing data leads to sound business decisions. In Latin America, the strategy relies on local distributors who know the markets and retailers well. In Europe, where complicated markets overlap and business is done in several languages, Char-Broil is leaning on acquisitions. The moves are working—Garcia and his colleagues have already tripled their arena budget for Latin America. Regardless of location, today’s grillers are looking for gourmet options at the best value. Recipes, accessories, and options for grilling health food, international cuisine, pizzas, steaks, desserts, and unusual dishes are in heavy demand. Garcia has built a responsive team of anxious and talented young marketers who are mentored by more conservative and seasoned veterans. As they seek to capitalize on the changing marketplace, they must do so carefully. Big-box retailers have pressure on the bottom line and occasionally can be resistant to change—especially change to best-selling products. “Stores give us a certain amount of space, and we have to make sure we are maximizing the financial value of that space,” Garcia says. The challenge is to come up with innovate ideas to satisfy consumers, but introduce them carefully to satisfy retailers as well. In 2013, Char-Broil introduced a full line of TRU-Infrared grills with performance, patio, commercial, and gourmet options in numerous sizes and colors. Garcia says the TRU-Infrared grills eliminate flare ups and cook food with infrared heat. The results? Juicier meat, evenly cooked foods, less fuel, and faster cooking times. With the debut of TRU-Infrared complete, Garcia’s team is setting its sights on product lines for the next five years. He can’t say much, but shares that Char-Broil is looking into fully automated and personalized grilling experiences that embrace smartphone and tablet technologies. While he waits for the long innovation cycle to play out and bring new products to market, Garcia builds Char-Broil’s audience through social media. “It’s impacting all brands in a tremendous way because we have stronger relationships with our consumers,” he says. Consumers are passionate about grilling, and use Facebook, Twitter, and other outlets (like the brand’s own user-driven Char-Broil Live portal) to find, share, and show off their latest barbecue creations. By interacting in this way, Garcia can understand needs, field complaints, and discover trends. “Social media drives us forward as a brand because it lets us talk to our consumers every day,” he says.